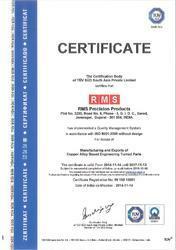 We, RMS Precision Products, started our operations in the year 2005 are an ISO 9001:2008 certified company, as the manufacturer, supplier and exporter of a comprehensive range of Precision Brass Components. The highly praised range of components offered by us is inclusive of Brass Components, Brass Inserts and Brass Forged Component. These precision components are highly acclaimed for their dimensional accuracy, long life, robust construction and high resistance to corrosion. The offered components are manufactured using superior grade of brass, aluminium and copper. The sophisticated infrastructural facility we own stands out in the market. Equipped with the finest and latest machines and equipment, our facility is further divided into a number of units that are led by a team of experienced and skilled professionals. Our employees work in a synchronized manner to attain the organizational goals. Finding application in a number of industries including automobile and machinery, our product range is much appreciated among the huge client base that we have been able to garner so far. Further, our ethical work practices and abiding by the industrial norms have helped us to acquire a huge client base. Under the leadership of our CEO, Mr. Rajesh Patel, we have achieved a higher level of success. His knowledge of the domain and constant guidance have been the source of our growth and motivation. Further, his keen interest in the welfare of our employees and regular trainings have helped them enhance their technical as well as soft skills. Our cater export service All Over The World. Manufacturing, Trading & Exporter of Precision Brass Components. At RMS Precision Products, we believe in giving our employees the credit of our success, as they work dedicatedly, efficiently and constantly towards achieving the organizational goals. For facilitating smooth operations, we have sorted our team of experienced professionals into a number of sub-units that work in close coordination with each other. Our experts put persistent efforts in innovating new and improved methods to boost productivity and improve quality. We are known to be a highly client oriented firm. In order to maintain this reputation, we engage in using of high grade brass, copper & aluminum and modern machines for the manufacturing of these components. The offered components are processed through a number of quality assurance tests for ensuring the flawlessness of the entire final range. Superior quality products, prompt delivery, transparent dealings and ethical business policies make us a preferred name among the huge client base that we have been able to garner.